Multifunction printers have been commonplace for many years, and allow you to print, scan, or copy any document with or without your computer, but when it comes to 3D is a little more complicated. First, it’s usually quite harder to design a 3D object than typing some text into a word processor, although 3D objects online database like thingiverse do help. 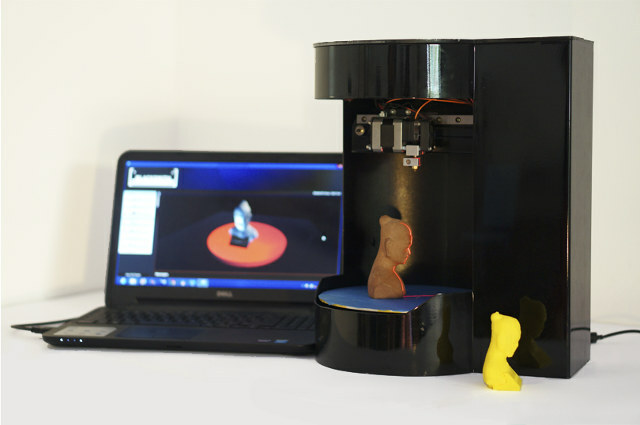 If you want to copy a 3D object, you may have to buy a 3D scanner such as MakerBot Digitizer, and a 3D printer such as Makerbot Replicator 2 which takes space and costs about $3,000 in total. Multifunction 3D printer are slowly coming to market with for example AIO Robotics Zeus which recently shipped to backers, and is now available for $2,500. An other option is Singapore made BlackSmith Genesis, a compact multifunction 3D printer that can print, scan, and copy objects based on a rotary design, that successfully completed a crowdfunding campaign last year, and is now taking pre-orders for $2,200 + $150 shipping max for June 2015 delivery. The printer-scanner is controlled via a web-based software bundle called Blacksmith Sorcerer. The camera for the scanner can also be used to remotely monitor the printing progress via your smartphone or tablet. The video below demonstrate the main features of the printer. very nice work by black smith. I saw your full video. This work amazing. very nice advantage by people. I also want to buy this machine for my children happiness and for my work. These are exiting ideas and photocopier is affordable and in use.In my school times many notes we did create through copiers.I think it is one of the greatest thing which is usable.